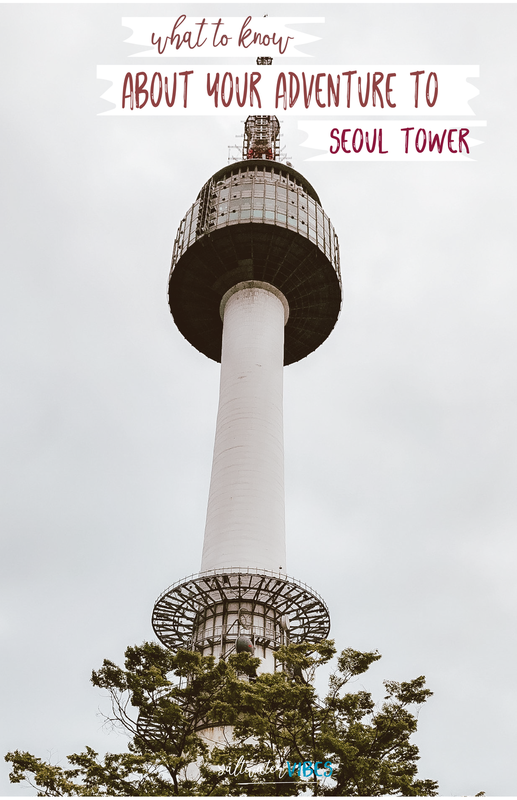 Seoul Tower is the perfect adventure any time your here. Come for a long time, or just pass through - it all depends on what you want to do! The main reason people come here is for the view and the love locks. But, there is also seven restaurants and two gift shops! They also host special events and campaigns. Right now they have a love and relationships campaign going on, you can read more about it here. The restaurants and gift shops vary on opening and closing hours so you can see them all here, and make reservations here! When we got up to the tower I was blown away! It was like a complex center underneath the actual tower. Most observation decks we go to are truly just that - a deck! Seoul Tower had all kinds of places to explore, shop and eat. I thought it was so neat and made the experience even more fun. We were able to buy some beers at the convience store and sit on the patio with the most epic view while we sipped away. Like I mentioned above this place is home to the absolute BEST view of Seoul. You can see 360 degrees around the tower and walk and tons of different platforms to see new viewpoints. I actually lost ALL my Seoul Pictures - which is a story for another day but was so lucky enough to at lest download all these to my phone that day! So I know my one measily picture of the view doesnt seem like much, I promise you it was unreal! Another thing I just loved about Asia is how photo friendly everything is!! They had these awesome phone stands like tri-pods free to use! They set them up in photogenic areas like this so you can snap away! I was so happy because Rashawn and I barley ever get photos together let alone fun ones like this. I will hold onto these memories foerver!! Seoul Tower attracts more couples then any where else in Seoul!! (That is just a fact from my brain based on the amount of love locks ha!). This place had thousands and thousands off these locks all over. You can buy them from the tower - but I think it was like $20! We didn't put one here for a few reasons but if you are looking to lock your love somewhere this is the place to do it! I was just so impressed by all the messages written on the locks, it is so fun to see! You can also bring your own lock from home. Getting to Seoul Tower is also an adventure! You can get to the actual tower by taxi, bus, subway, or your little feeties :) But once here you have some more options on how to reach the top! For starters, you take this super cool glass elevator up the hill - it is totally free and anyone can use it! Once there, you can either pay for a cable car or walk the stairs up! We walked stars up and cable car down to save some money! Here is the prices for the car. I would love to come back here again one day! I truly believe in seeing the city from above in every new place you go. Do you like seeing cities from above?